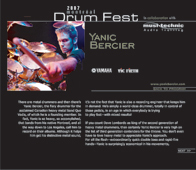 I am proud to announce that I will perform at the 2007 MONTREAL DRUM FEST, in Montreal, QC, Canada! The performance is scheduled for 13:00 on Saturday November 10. 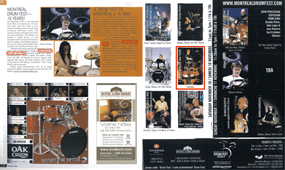 Other drummers scheduled for the festival include Thomas Lang, Alex Acuna, Peter Erskine, Will Calhoun, and many others. Refer to the festival website for more information. Advertisements for the festival have been posted in the Press section of my website.